This is a normal ultrasound performed at 17 weeks gestation. It shows the placenta during a normal (Braxton Hicks) contraction. Throughout the pregnancy, the uterus periodically contracts to facilitate better blood flow through the placenta and the fetus. 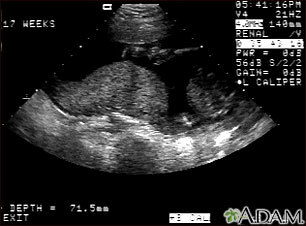 In this ultrasound, the placenta can be seen as the mound-shaped object in the middle of the screen. At the bottom of the image, the mother's vertebra can be seen as a round object. When the uterus is not contracting, the placenta would appear much flatter.